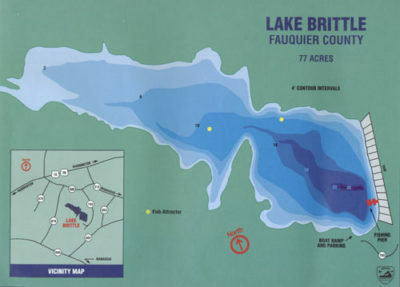 Lake Brittle is a 77-acre impoundment located in Fauquier County. It was constructed in 1953 as a public fishing lake. It is one of the oldest Department-owned lakes and among the first to be built in Virginia with Dingell-Johnson funds. Dingell-Johnson funds are provided by a federal excise tax on fishing tackle. Lake Brittle is located just east of Warrenton and only thirty miles from the Beltway. The lake’s average depth is about seven feet, and it has a maximum depth of 25 feet near the spillway tower. Lake Brittle supports a warmwater fish community including Largemouth Bass, Bluegill, Redear Sunfish, Black Crappie and Channel Catfish. The lake has been stocked annually with Walleye since 1979. Flathead Catfish were stocked in 1990 and 1994 to control the abundant sunfish population and undesirable species such as Brown Bullhead and Gizzard Shad which managed to proliferate to produce large populations. Northern Snakehead were first documented in 2015 and are apparently now self-sustaining due to illegal stocking. Biologists will monitor potential changes to the lake’s ecology with annual surveys to evaluate impacts to other fish populations. Anglers are encouraged to harvest any and all snakeheads caught (no length or bag limits), as they are excellent table fare. The management objective of Lake Brittle is to maintain pan fish and bass population size structures and average weights. The “balance” of the fishery is based on the predation of sunfish and gizzard shad by catfish, largemouth bass and walleye. It may be necessary to maintain high predator numbers to sufficiently control overpopulations of stunted, slow growing prey species. Following a multi-year drawdown to repair erosion to the dam and emergency spillway, the bass population was in excellent condition in 2015 based on spring electrofishing surveys. Lake Brittle is located just to the southeast of New Baltimore off of Route 29/Route 15. Signs for Lake Brittle will be seen as you reach the Route 600 intersection. Take Route 600 east to Route 793. Route 793 will take you to the lake. The main target species at Lake Brittle are sunfish (bluegill and redear sunfish), largemouth bass and channel catfish. The majority of the fishing pressure is placed upon these species. The lake also provides angling opportunities for walleye, black crappie and flathead catfish. The preferred game fish of Lake Brittle anglers have been sunfish species. Creel survey data since 1987 have shown that upwards of 60% of anglers target bluegill and redear sunfish. Lake Brittle provides good fishing for redear sunfish (a.k.a. shell crackers). Redear sunfish average about one-half pound and consistently provide good action. The bluegill fishery has suffered from the overabundance of gizzard shad and has been stunted and displayed poor size structure for many years. The average angler can catch high numbers of small bluegills. If you are searching for trophy bluegills, you might want to try another lake. Lake Brittle continues to provide a very good largemouth bass fishery. The average bass is in the 2-3 pound size class with a decent number of “keepers” in the 3-6 pound class. Channel catfish are stocked annually at a rate of 25/acre to provide increased angling opportunity. The average Lake Brittle catfish weighs about two pounds, however, much larger fish are caught by anglers. Fisheries biologists recently concluded a catfish research project that included Lake Brittle as one of the study lakes (gill nets were used to sample the catfish population). The project indicated that the channel catfish population was in good condition with a decent number of larger fish present. Walleye stocking began in 1979 to add diversity to the fishery along with the hope of controlling the gizzard shad population. The current walleye-stocking rate is 100/acre. A special walleye section was published in the June 2001 issue of Virginia Wildlife, which included the findings of a recently completed research study completed at Lake Brittle and other state waters. Anglers looking to enjoy this unique fishery should obtain this handy reference from a local DGIF office. This document is also available online. (PDF – 2.8 MB). Lake Brittle supports a stunted black crappie fishery. Electrofishing and trap net samples have failed to produce many crappie over 10 inches in length. Typically, spawning success is highly variable among crappie populations – crappie can go for a few years without having a successful spawn, and then with the right conditions, produce a massive year class. The growth rates of black crappie have historically been poor, staying consistent with that of a stunted population. Flathead catfish were initially stocked into Lake Brittle in 1990 to help control forage fish numbers and improve fish community structure. Seventy-seven flathead catfish (averaging 2 pounds) were electrofished from the Altamaha River in Georgia and transported to Lake Brittle. Another stocking in 1994 consisted of 34 flathead catfish from the James River. Sampling of Lake Brittle by fisheries biologists has shown that flathead catfish have survived to have a positive impact on the fishery. The flathead catfish have successfully thinned out the stunted brown bullhead population. Anglers are encouraged to carefully release all flathead catfish caught at Lake Brittle. There is a 12-15 inch slot limit on largemouth bass in Lake Brittle. All bass between 12 and 15 inches must be immediately released unharmed. Anglers can harvest five bass per day under 12 inches or over 15 inches or any combination of the two. There is no size limit for sunfish (bluegill, redear etc.) in Lake Brittle. Anglers can harvest 50 sunfish (combined) per day. There is no size limit for brown bullhead, channel or flathead catfish. Anglers can harvest 10 per day of each species. Anglers are encouraged to release flathead catfish so they can continue to forage upon stunted bluegill, brown bullheads and gizzard shad. There is an 18 inch minimum size limit on walleye in Lake Brittle. Anglers can harvest 5 walleye per day. There is no size limit on black crappie in Lake Brittle. Anglers can harvest 25 black crappie per day. Camping, swimming, sailboats, hunting, trotlines and fishing tournaments involving prizes are prohibited. Gill nets, seines and gasoline motors are prohibited except for official Department duties. Cast nets are permitted for catching gizzard shad. Boat anglers are permitted to use trolling motors on Lake Brittle. Anglers with outboard motors on their boats can fish the lake as long as their motor is trimmed/propped up out of the water. The gas tank should be removed from the boat if at all possible or the gas line disconnected. Wading while fishing is not permitted. Lake Brittle receives heavy fishing pressure due in part to its proximity to the Washington, DC metropolitan area and the continued unfortunate closure of Lake Manassas. Anglers will find plenty of shoreline access along with a relatively new fishing pier. The boat ramp and finger pier provide anglers with year-round, 24-hour private boat access. The lake has an Angler Service Center operated by Picnic Pavilion which can be reached by calling 540-341-1995) that offers boat and electric motor rental along with bait and snack sales daily March 15th through October 15th. The concession may be closed on one or two weekdays after July 1st, so be sure to call if you are interested in renting a boat or buying bait during this time.